Tough Guy Productions is proud to launch the Inaugural “MTB Town Series.” This series kicks off March 12th, 2019 with a short track cross country (STXC) race at Coler Preserve and continues running throughout spring on select Tuesday nights. As a way to showcase the riding variety of the OZ Trail systems, along with different race formats, this series boasts 3 STXC races, 3 Intro to Enduro races, and 3 cross country races. Designed for all abilities and ages, riders are encouraged to discover the camaraderie of the OZ mountain bike community. Whether you have raced for years or are a first time racer this is the series for you. The MTB Town Series gives the OZ community a taste of different racing forms and increase your time spent on a bike. 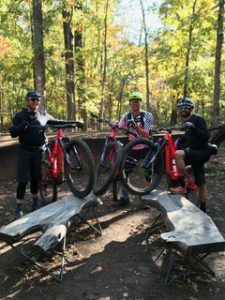 Come join us, get a jump start on your summer fitness, and, most importantly, have a blast with like minded individuals who also love to ride! Tough Guy Productions is excited to announce a new, family-friendly style of racing to add to the mix of opportunities of spending time in the saddle of your bike. The sport of mountain biking has proven to bring communities together. From the entry level rider intrigued by the fresh air and satisfaction of being on a bike to the addicted mechanic, cleaning every spec of dirt off of their “baby” while hitting refresh on Pink Bike; all whom share like-minded dreams and aspirations. Enjoyment and Companionship. Yes, the sport has proven that shedding milliseconds off personal best to place on a podium are what differentiate the best in their class, but these individuals did not just wake up one day and land on the pinnacle of their sport. They started with family and friends who supported them in reaching their goals. Combining individual goals for oneself to strive for with the comradery of hitting the trails with your best friends is what make this community stand alone. With the mindset that everyone had to start somewhere, this week-night series was built with the entire community in mind. To break down the “walls” of intimidation for first-time racers and provide veterans a way to break out their jerseys a few more times throughout the year. Mountain bike racing is as much a social event as it is an individual activity and support throughout the community will instill an even greater growth to the sport we love. Tough Guy Productions (TGP) is excited to provide the general pubic one more excuse to be on their bikes during the week. TGP is working diligently with the local community members and businesses to bring new aspects to current race structures and provide entertainment for individuals who may not want to participate in the race. It takes all ability levels to gather in a safe, friendly environment in order to grow the mountain bike community as a whole and TGP looks forward to enjoying these week night races with you. The race series is launching March 12th, 2019 at Coler Mountain Bike Preserve in Bentonville, Arkansas, and will continue on select Tuesday nights throughout the spring. The MTB Town Series will provide the OZ community a taste of different racing formats to participate in at a low cost to participants. Visit Tough Guy Productions or our Facebook Page for more information and to stay up to date with race information.